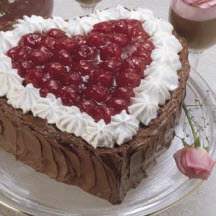 A romantic take on the classic Black Forest cake that's sure to please your sweetheart. In small bowl, beat egg whites until foamy; gradually add 1/2 cup sugar, beating until stiff peaks form. Set aside. In large bowl, stir together flour, remaining 1 cup sugar, cocoa, baking soda and salt. Add oil, buttermilk and egg yolks; beat until smooth. Gently fold egg whites into batter. Pour about 1 2/3 cups batter into each prepared pan. Bake 18 to 20 minutes or until cake springs back when touched lightly in center. Cool 5 minutes; remove from pans to wire racks. Bake remaining layer, if necessary. Cool 5 minutes; remove from pan to wire rack. Cool completely. Place 1 layer on serving plate; pipe or spoon 1-inch border 1/2 inch thick around outer edge of layer. Spread half of pie filling in center. Top with second cake layer. Spread layer with half of remaining CREAM FILLING. Top with third layer. Spoon remaining pie filling on top of cake to within 1 inch of edge. Prepare CHOCOLATE WHIPPED CREAM; frost sides of cake. Pipe top edge with remaining CREAM FILLING. Refrigerate until serving time. Cover; store leftover torte in refrigerator. *To sour milk: Use 1 tablespoon white vinegar plus milk to equal 1 cup. **If only two pans are available, reserve remaining batter in refrigerator for the third layer while first 2 layers bake.